Arts, they say, is the imitation of reality. But sometimes, it is nothing but prophecies or maybe those involved tend to get carried away and forget when it is back to reality. That is probably the reason why there are many TV couples who dated or got married in real life. While some of these celebrities who began dating when fiction crossed the way of reality remained together for many years, a good number of others could not sustain for too long. Keep reading as we take you through an interesting list of TV couples who dated or got married and even became real couples. In Game of Thrones, these two should not fall in love, because Snow (Kit Harington)is a Night’s Watch while Ygritte (Rose Leslie) is a Wilding but they still did. In real life, the pair began dating in 2012, the same year that they were first starred in the HBO series. They broke up in 2013 before finding their ways back to each other again. The Game of Thrones love interests kept everything hidden from the public until 2016 that it came open that they had already been dating for years. Their love story which began in Iceland led to an engagement in September 2017, and then in 2018, they became man and wife. For these two, the love began when they first met when they were screen testing for the HBO TV show, True Blood. Three months later when they met again, Moyer was sure he wanted to share the rest of his life with his True Blood love interest. By the time the show finally came to an end in 2014, Anna Paquin and Stephen Moyer had already been married for four years. Their union is now blessed with two kids, a set of twins that were born in 2012. The first time this couple met was on the set of Buffy the Vampire Slayer, but it did not start very well for them. When the actress first met the man who would be her husband, she took interest in him but he would not go out with her because he had a rule never to date co-workers. However, after he left the show, they later began dating. One advice she got from her mom who raised her as a single mother was to be very sure of any man before marrying him, and so Hannigan dated Denisof for four years before finally agreeing to marry him. They tied the knot in 2003 and are blessed with two daughters. In The Big Bang Theory, Penny (Kaley Cuoco) and Leonard (Johnny Galecki) may not be the perfect couple, but there is a lot to love about them. Well, they also joined the TV couples who dated when they got into a secret relationship that lasted two years until 2010. The relationship ended because they could not go out together or do anything outside as a couple because of the show. 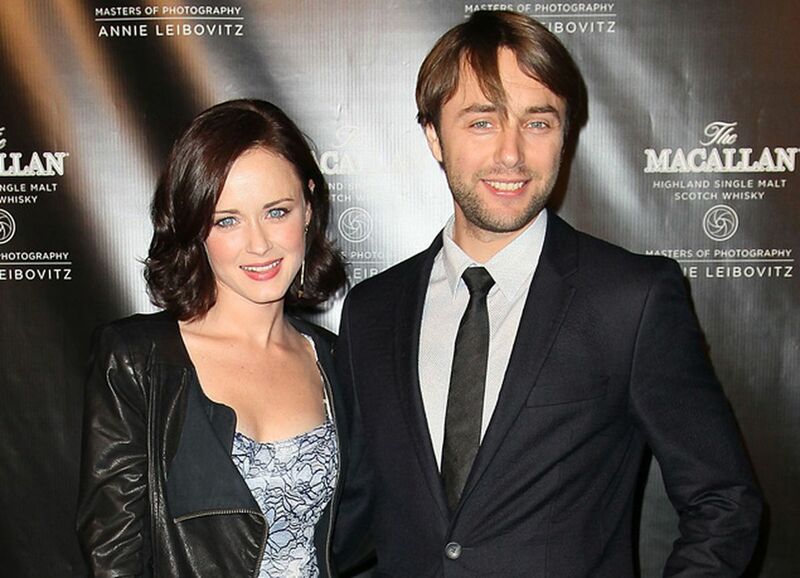 It was on the set for Mad Men that this pair first met in 2012 although Alexis Bledel only made guest appearances on the TV series. The two began dating the same year and by 2013, they were ready to settle together and so they got engaged. By 2014, they were already man and wife. The couple welcomed their first child together in 2013. Sophia and Chad met on the set for The WB show and they began dating in 2004. The beautiful couple got married in 2005 but only 5 months later, they were separated only to be finally divorced in 2006. According to Sophia, she was young and stupid when she got married to Chad and she is angered by the fact that she is now just another statistic in Hollywood even though all she ever wanted was to be married once. It was in 2012 that the romance between the pair started after they met on the set of the series, Glee. They became an item, spending almost all their free time together. Because of the substance addiction he was suffering from, Lea encouraged Cory to go to rehab, which he did. Not too long after he was through with his treatment, he died from substance abuse in 2013, leaving Lea devastated. Although she recently got married in 2019 to Zandy Reich; she still remembers her late boyfriend and even has many tattoos in his memory. When That ‘70s Show began, the actress (Mila Kunis) was only 14 in 1998, while the actor (Ashton Kutcher) was 19. On set for the show, Mila had her first ever kiss and it was with Ashton. Because of their ages at the time, they considered themselves more like siblings than anything else. In 2005, the actor would tie the knot with Demi Moore but that would end in 2011. 2012 would see the former That 70’s Show’s stars reconnecting again. By 2014, they were engaged before having their first child. They finally got married in 2015 and had their second child in 2016. Love arrested this couple when they were on set for the Arrested Development in which Gob (Will Arnett) got married to a woman he just met who happened to be Amy Poehler. In reality, they got married in 2003 having dated since 2000. Will and Amy have appeared in various other productions together including Blades of Glory (2007). Even though they were blessed with two sons, nothing was able to prevent the marriage from officially ending in 2016 having been separated since 2012. In this TV show, the character of Charlie Day (Charlie Kelly) was obsessed with Ellis (a waitress) so much that you would feel she should just give the man a chance. When she finally did, it was real. Literally. Their first ever meeting was in 2001, but it was in 2004 that they began dating and by 2006, they had decided to start the journey of life as man and wife. They have a child between them. It was in Lost that Dominic Monaghan and Evangeline Lilly found each other. They joined the list of TV couples who dated when they kicked off their relationship in 2004 while filming in Hawai. Dominic (Charlie Pace) was a former rock star who is now addicted to drugs, while Lilly (Kate Austen) is a fugitive. Although they were paired in the show, they did not date. In real life, however, they dated from 2004 to 2009 on and off. Before they started their relationship, Lilly was married to Murray Hone; however, the marriage ended only a year after it began in 2003. Yet another of the TV couples who dated that was brought together by It’s Always Sunny in Philadelphia, is Kaitlin Olson and Rob McElhenney. The couple fell for each other when the FXX comedy was still in its early seasons. According to Olson who appeared as Dee in the show, she fell in love with Rob (Mac) because of the ease with which he handled his work. At first, they kept their relationship secret for some time before finally coming out as a couple. They began dating in 2006 and tied the knot in 2008. They have two children together. Once upon a time, on the set of the TV show, Once upon a time, in which Josh Dallas played the role of Prince charming and Ginnifer Goodwin played Snow White, the couple met and turned their fascinating fairy tale love story to an enchanting story in real life. The couple began dating off-screen in 2011 and then in October 2013, Josh proposed to Ginnifer. The two became man and wife in 2014. Their union has been blessed with two sons Oliver Finlay Dallas and Hugo Wilson Dallas. In 2009, the British TV series, Wuthering Heights, Hardy featured as Heathcliff who fell in love with Catherine Earnshaw (Charlotte), although the relationship was not to last. After the series ended, the two began dating and in 2018, they got married in a secret event. They have three children between them. Before Gotham brought this couple together, Morena Baccarin was first married to film director and producer, Austin Chick. She revealed in 2013 that she had a dream that she was married to someone who was not her husband but was then having an affair with her husband in the dream. In 2014, she was cast as Leslie Thompkins on Gotham alongside Benjamin McKenzie (Detective Jim Gordon) who was her onscreen lover. Before long, Austin filed for divorce on the grounds that his wife cheated on him with McKenzie. The Gotham duo got married in 2017 and they have a child together. Their daughter, Frances Laiz Setta Schenkkan was born in 2016 before they got married.